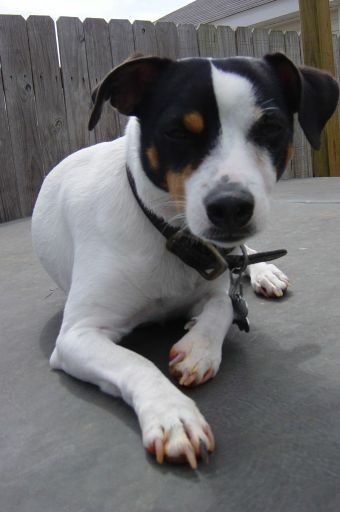 True Story: My Jack Russell, Abby Singer, rules the world. Yes, that’s right. All of your “free will” choices and decisions are not really up to you. Abby Singer and her right paw with the solid black middle nail is in charge of the universe. She let’s us know how high to jump with this paw on a daily basis. She taps the door when she wants out, she taps her food or water bowl when she wants them filled. She taps the treat drawer and any where I’ve ever kept a treat when she wants one. She taps the couch when she wants us to lift it, yes I said lift it, up to see if she may have left a bone there. When my mother gave her to us 6 1/2 years ago she said, “if you take care of her she’ll last you 15 years”. Me: Mom, she’s not a vacuum cleaner. Her first summer at the beach with us she had some itchy skin, typical of small breeds, my mother-in-law said we should put her down. She doesn’t stay with Gamaw (MIL) when we go out of town. My sister says, “With that black nail it looks like Abby Singer is shooting everybody a bird”.